The Axiom is a powerful new multifunction navigation system from Raymarine. 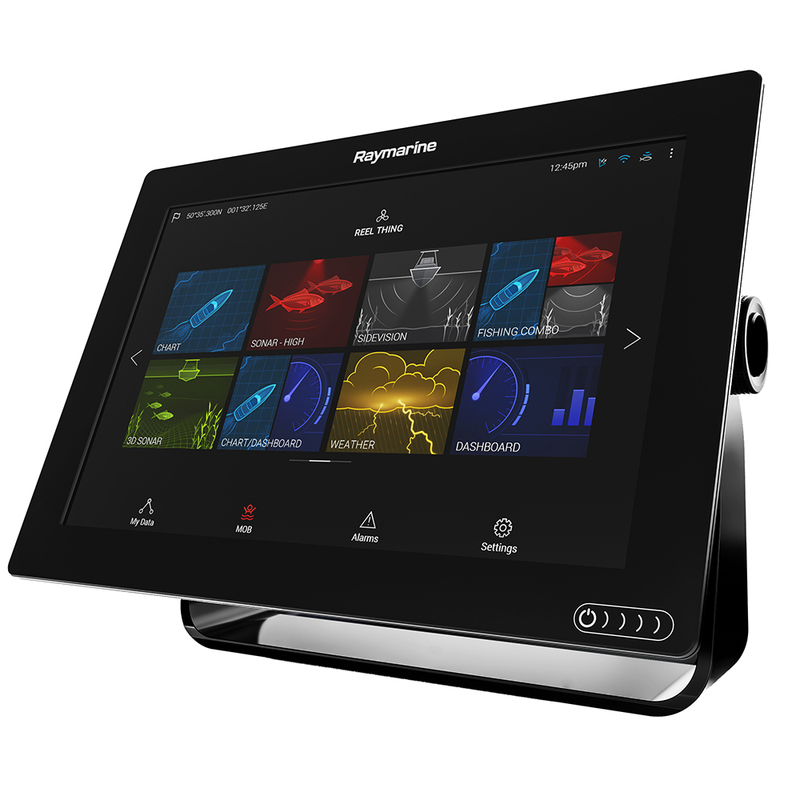 The Axiom 12 features a 12-inch glass touchscreen display with Raymarine's powerful LightHouse 3 operating system and a supercharged quad-core processor. The Axiom 12 comes with a built-in GPS receiver. It is bundled with Navionics+ Charts for North America with full coastal coverage for the USA and Canada, plus over 80,000 inland ponds, lakes and rivers. The Navionics+ charts are also compatible with advanced features like SonarChart Live and Dock-to-dock Autorouting. Axiom 12 also works with wide array of raster and vector electronic charts from C-MAP and LightHouse Charts. Axiom 12 is expandable so its capabilities can grow as needed. It supports the full range of Raymarine accessories including Quantum radar, CHIRP Sonar, SiriusXM marine weather, audio integration, instruments, cameras, and Evolution autopilot. Axiom 12 also features standard Wi-Fi and Bluetooth connectivity so it can connect with the latest Raymarine apps for tablets and Smartphones. The Axiom 12 includes surface and trunnion mounting kits, mounting hardware, power/data cable, 1m SeaTalkhsnetwork cable, NMEA2000 network adapter and installation instructions. LightHouse 3 OS is fast, fluid, and easy to learn. An uncluttered interface that is easily personalized for your style of navigating. Fast 10 Hz 72 Channel GPS/GLONASS Receiver for rapid position and heading updates and smooth on screen tracking. Navionics+ Charts Included. Axiom 9 also supports C-MAP, as well as LightHouse Raster and Vector Charts from leading map makers like NV Digital, Blue Latitude, and more. Navigate Safely at Night with the optional FLIR M100 and M200 compact marine thermal cameras. Quantum CHIRP Radar Ready - Superior solid state CHIRP radar delivers no compromise performance on long and extremely short ranges. Marine Audio Control - Turn up the volume and control NMEA2000 compatible marine audio systems like Rockford Fosgate. Built-in Wi-Fi lets you to stream and control Axiom right from your smartphone or tablet. You can also sync Axiom's waypoints, routes, and charts with Navionics mobile apps. RAM MOUNT MARINE ELECTRONICS MOUNT-GIMBAL BRACKET UNDER 15LBS.